BBC NEWS | Middle East | The Chalabis: Victims or villains? 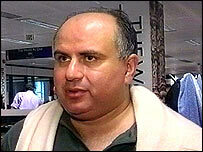 The Chalabis: Victims or villains? The warrants for Ahmed and Salem Chalabi mark one more twist to an extraordinary saga. Back in May, in the dying days of the US-led administration in Baghdad, Iraqi and American security forces raided Ahmed's home in the Iraqi capital. It was dramatic proof of the fall from grace of the man once tipped to succeed Saddam Hussein. He stood accused of a range of offences including embezzlement, kidnapping and the theft of government property. Privately, senior US officials accused their former protege of misleading them about Saddam's alleged weapons of mass destruction - and passing sensitive intelligence to neighbouring Iran. Now the Iraqi authorities are taking matters further. On Sunday, an Iraqi judge issued arrest warrants for Ahmed and his nephew, Salem. Both men are currently outside Iraq, and both have vigorously denied the charges, which they say are part of a political vendetta against them. To their supporters, Salem and Ahmed Chalabi are Iraqi patriots who fought long and hard against the Saddam Hussein dictatorship. According to this view, they are now being victimised by their former friends in Washington and their rivals in the new interim Iraqi government. To their critics they are politicians who will stop at nothing to gain power in Baghdad. Given the accusations of corruption which have long dogged Ahmed Chalabi, this new charge will scarcely come as a big surprise to many Iraqis. But equally it is no secret that he and Iraq's new interim Prime Minister, Iyad Allawi, are long-time rivals. During their long years in exile, as opponents of the Saddam regime, Mr Allawi built up close ties with US and British intelligence while Mr Chalabi became the favourite of the Pentagon and the Washington hawks. So, whatever the truth of the allegations, there will inevitably be some suspicion in Baghdad that they are designed to neutralise a troublesome political opponent. 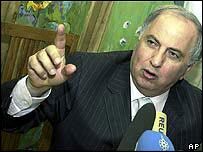 If Salem Chalabi, currently in Britain, returns to Baghdad and is formally charged, he seems certain to be removed from his position as the head of the special tribunal. If his uncle, who is in Iran, returns home and is charged, this would presumably disqualify him from standing in crucial parliamentary elections due to take place in January.